Football World Cup in Sailing launched . . .
A new era in competitive sailing dawned with the official launch of the Star Sailors League Gold Cup at the Olympic Museum in Lausanne. 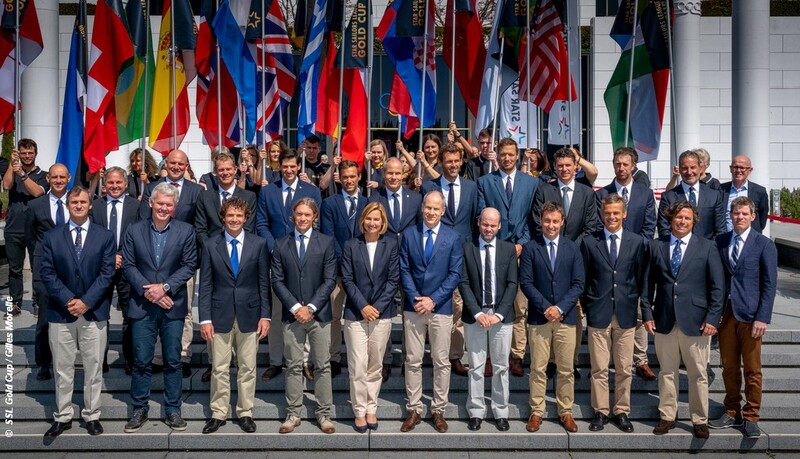 This will see each nation’s top sailing athletes team together into a single crew and then race against one another aboard high performance 47 foot long one design monohulls to establish ‘the world’s best sailing nation’. Boats are supplied to ensure that, as in the Olympics, it is the sailors who make the difference and not the boats. The SSL Gold Cup is set to occur biennially, taking place for the first time in Switzerland during September and October 2021. Specifically, the SSL Gold Cup format will comprise four knock-out qualifying rounds for 16 teams each, taking place out of SSL’s state of the art headquarters and training centre in Grandson on Lake Neuchâtel. Each of these 16 will be divided into four flights of four boats, the outcome of each based on up to five windward-leeward races. After the qualification rounds, the SSL Gold Cup then moves from Lake Neuchâtel to Geneva for the final rounds. Here on Lake Geneva the top eight from the qualifying rounds join the top eight seeded teams in the quarter-finals. The top eight from this progress through semi-finals to determine the four finalists and ultimately the winner being crowned the SSL Gold Cup champion nation. The SSL Gold Cup is open to any nations of the 144 Member National Authorities recognised by World Sailing. Within the first three months after the entry period opened, and with six months to go until the entry deadline for the 2021 SSL Gold Cup, forty countries from all five continents confirmed their participation. A maximum of 48 teams will be able compete in this first edition of the SSL Gold Cup. Significantly it is the captain of each team who gets to choose five sailors, which, for example, might fill key roles on board such as tactician, bowman and pitman. The other remaining sailors on board will be the four highest placed for that nation in the SSL Ranking. The SSL47 high performance keelboat to be used for the SSL Gold Cup will be supplied to teams for their use, and training time aboard the boat will be crucial. For this purpose the SSL has established a state of the art training centre at its new headquarters on the shore of Lake Neuchâtel in Switzerland. The world class facilities here include a private harbour, broadcast centre and TV studio, and a fitness centre, all housed within the grounds of a manor house set in a large private park. Over the coming weeks there will be further announcements of new national teams and their captains.